Like I mentioned yesterday, we just got back from vacation. 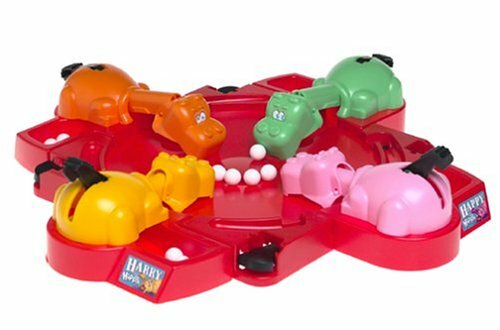 While we were there, Grandma brought a game for Madame's cousins (3 and 5 years old) that was a huge hit - Hasbro's Hungry Hungry Hippos. I remembered the commercial from when I was a kid (or more specifically, the jingle - something like "If you want to win the game you've got to take good aim, and catch the most marbles with your hippo! Playing Hungry Hungry Hippos..."), but I had no idea they still made it. It's really simple. You release the marbles and then press a switch down on the back of your hippo that causes it to jut it's head out to gobble a marble. I guess you can't improve on a classic, because this thing kept the cousins occupied for hours. For the adults, we spent the most time playing a game that we had just recently discovered called Mexican Train Dominoes. It's a basic double twelve domino game, but for some reason it's pretty addictive. It worked out great for the family because it's a low-key game that you can play while hanging out drinking beers and talking. Plus there's the added bonus of nothing to argue about while playing it - a six matches a six, no discussion.